Once again Los Gigantes is being battered by bad weather. Heavy rain, thunder storms, high winds and rough seas are causing chaos for locals and tourists. This week no boats are leaving or entering the marina. As I write this you can’t see the cliffs from the marina because the rain is so heavy. Until Friday a severe weather warning has been issued by the met office. Local authorities and the Fire Brigade are once again inundated with calls for help and in the area of Las Chafiras, they are stretched to their limit having to pump water from flooded homes and roofs have been blown off in the high winds. Trees have been blown down, but luckily there have been no reports of injuries. Yet again the road to Teide is closed. 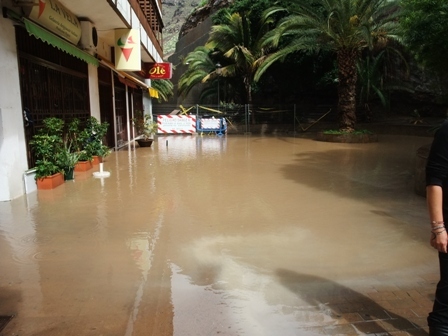 After the torrential rain this morning, with rivers running down every road, residents in Los Gigantes are once again mopping up. 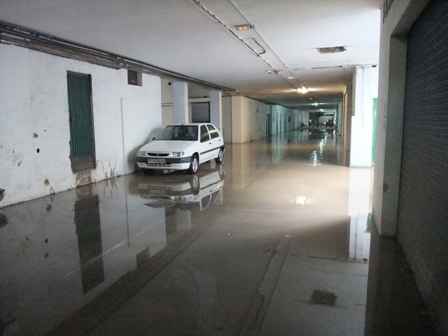 The beach road drains were soon blocked with mud and stones causing flooding yet again to the shops and restaurant and this time the flooding of Poblado garages. 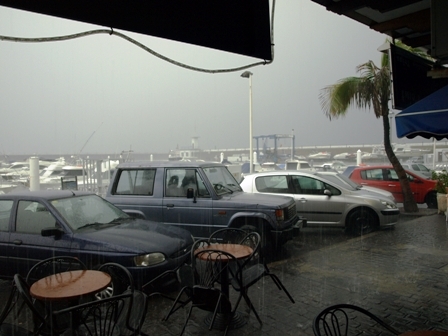 Amidst the doom and gloom of the credit crunch which is affecting tourism here in Tenerife, matters are being made even more miserable by yet another spell of rain, high winds and rough seas, it’s the worst weather the Canary Islands have seen for many years. The Los Gigantes area is generally better off than most other parts of the island claiming the highest sunshine records and very little rain. 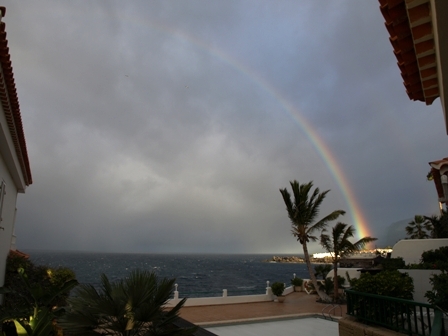 This picture of a rainbow over Los Gigantes Cliffs was taken this morning at 9am but as I write this the sun is now shining again, although it is still very windy and the sea is a good force 4, tour boats would be crazy to venture out in these conditions. It is predicted that worst affected areas of Tenerife will be Vilaflor and La Orotava and it is expected that the island of La Palma will be worst hit.